"The sharing of hurt is the beginning of healing"
Saying Goodbye to your baby - Available from Sands -This booklet for parents was first published by Sands in the 1980s. It has now been updated and re-written, drawing on the experiences and insights of parents who have themselves lost one or more babies. The booklet covers everything that new bereaved parents are likely to find useful in the first few days and in the longer term, and deals both with emotions and with practical matters. Family members, friends and health professionals will also find this booklet useful in understanding parents' experiences and the issues that are likely to be. Where did I go wrong - By Sarah Speake - Available from Sands - Is a personal account of the journey Sarah Speake has made since her daughter Amelie's unexpectedly early birth and subsequent death, a mere eleven days later. Her experience has altered the core of who she is irrevocably, and made her re-assess her priorities. This book details the agonies of Amelie's life in intensive care, and the emotional rollercoaster Sarah and her husband Martin have. A Gift off Words - By Sheryl McMahon - Available from Sands - A moving collection of more than 100 poems written by parents,grandparents, siblings, and other family members in respect of their own personal experience of the death of a baby. Futures Lost, Futures Found - Available from Sands Lothians - With the death of a baby, the magnitude of coming to terms with a future lost overwhelming. How do you get through the first few days, let alone the years, when you have lost the future you envisaged The stories contained in this book are written accounts of grieving parents in the days, months and years following the death of their precious babies. Philomena - By Martin Sixsmith - The true story of a mother and the son she had to give away. Grief Works - By Julia Samuel MBE- Death is the last great taboo, and its consequence, grief, is profoundly misunderstood. In Grief Works we hear stories from those who have experienced great love and great loss - and survived. Stories that explain how grief unmasks our greatest fears, strips away our layers of protection and reveals our innermost selves. Julia Samuel, a grief psychotherapist, has spent twenty-five years working with the bereaved and understanding the full repercussions of loss. This deeply affecting book is full of psychological insights on how grief, if approached correctly, can heal us. Through elegant, moving stories, we learn how we can stop feeling awkward and uncertain about death, and not shy away from talking honestly with family and friends. This extraordinary book shows us how to live and learn from great loss. 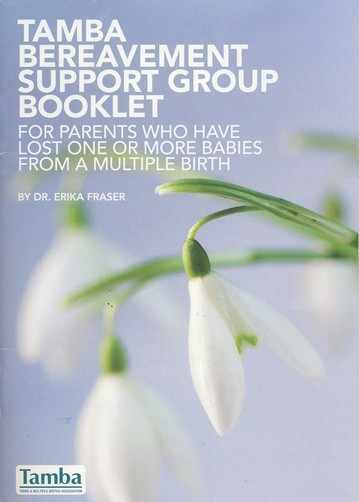 Tamba Bereavement Booklet - By Erika Fraser - Available from TAMBA (Twins & Multiple Births Association). Information for parents who have lost one or more babies from a multiple birth. The Lone Twin -Understanding Twin Bereavement and Loss - By Joan Woodward This book includes parental attitudes to the surviving twin, the feelings of the surviving twin and the effect of loss in adulthood. Fr om A Clear Blue Sky - By Timothy Knatchbell -“We all have a car crash in our lives. To date I have had one; it happened to be a bomb I was a boy at the time, on a small boat in Ireland. Three of my family and a friend died in the explosion. One of the dead was my identical twin brother Nicholas. My parents and I were the only survivors". A Star for Bobby - By Helen Keenor - Published By Sands - This is a book which talks directly to young children, using language and illustrations they can understand, about the death of a brother or sister, explaining why sometimes these things happen and how this may be making them feel. A Star for Bobby tells the story of a family of birds. One of the newly hatched birds Bobby, is sick and soon dies. Bobby is buried and his brother and sister, on going to bed that evening, look up at the night sky to see a star shining especially brightly, Bobby's star. 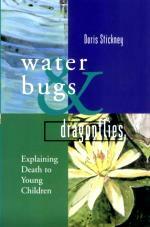 Waterbugs and Dragonflies - By Doris Stickney - Explains to young children about death. 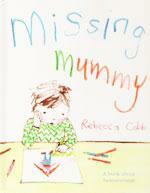 Missing Mummy - By Rebecca Cobb - A child's view of the loss of a mother. We were going to have a baby, but we had an angel instead - By Pat Schwiebert - Addresses the issues that children may face over the loss of an unborn child and also gives parents practical and sensitive advice to help their children cope with the death. Recommended for children ages two and over.